Students at Mfuwe Secondary School. All photos by Josh Rubin. As the creative masterminds behind , Josh Rubin and Evan Orensten have a knack for finding out where good ideas and good design intersect all over the world. On their second trip to Zambia's South Luanga National Park, they added good deeds to the roster, bringing together 30 like-minded travelers (including Popupla co-founder Jeralyn Gerba) for a thoughtfully planned Cool Hunting Safari. The group ventured beyond the bush to meet local entrepreneurs, teach workshops at a secondary school, and spread the word about the hardworking community. Tell us about the I-Travel-for-the-Good-aspect of Cool Hunting's safari experience. The actual safari component was with in their lodge and camps in Zambia's iconic South Luanga National Park. They knew it was important to us that our guests learn about the area by spending time in Mfuwe, the small village where most of The Buschamp Company's employees live. It's not a town focused on tourism, as nearly all tourists stay in the adjacent park. There aren't restaurants or shops that cater to the tourists either. But there is a great local business called Tribal Textiles, so we arranged a visit to show our guests what it's like running a small business in a rural part of Zambia. Additionally, The Bushcamp Company created a foundation called Charity Begins at Home that helps its employees' children attend the local school. Before the trip, we got to know the school and its needs and were able to host a day of workshops and lessons for the students. It was a great way to start the trip, break the ice, and change people's mindsets. 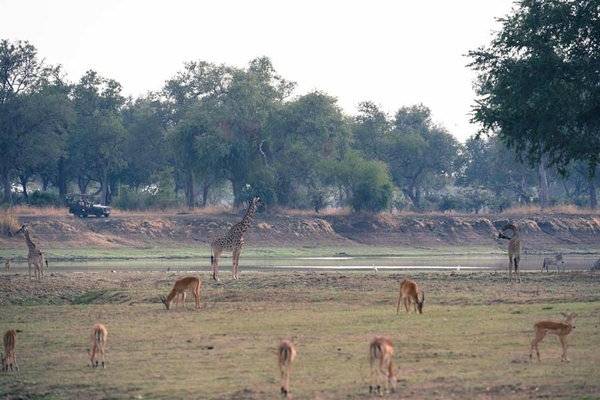 The scene at South Luangwa National Park. Did you have any prior personal connections to the place, the people, the project? We met Andy, who started and runs Bushcamp, in NYC. We had been interested in Zambia while we were researching possible holidays there, but otherwise didn't have any connection to it. We connected with Andy right away and felt comfortable working with him to help create the kind of experience we'd been envisioning. Our guests planned workshops for the Mfuwe Day Secondary School. Anyone who wanted to had the opportunity to teach a session. We brought a group of students back to the lodge with us and brought them with us on a game drive. Even though they live next to the park, many of them have never been inside, and only one had ever been on a drive before. For most of the students, it was the first time they had tried Western food, the first time they ever had dinner with tourists. It was a powerful day. The students learned a little about the people who visit their country and their town. 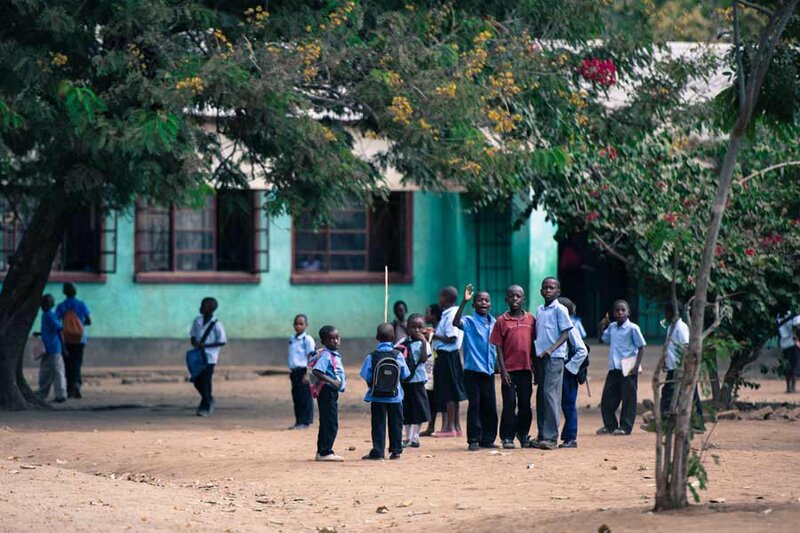 We learned a little about what it's like to be a student in a rural village in Zambia. A jewelry workshop at school. Part of the experience involved unique programming we created in conjunction with the team at The Bushcamp Company. 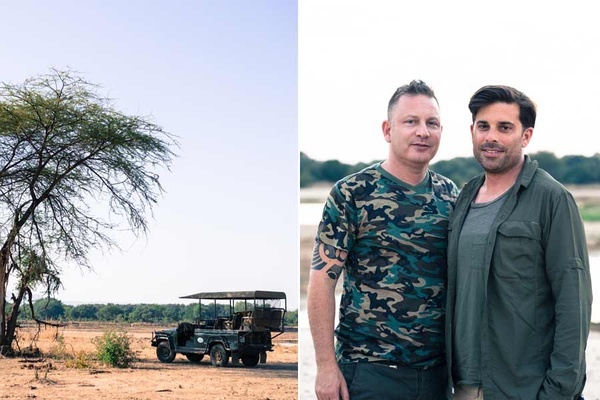 They were all for trying things that they hadn't done before — plated dinner for 30 in the bush, an outdoor theater performance with a local drama company, African wine tastings, wildlife photography tutorials, and so on. Taking over the whole property gave us the opportunity to do some fun things, and the staff was willing and able to deliver day after day. The students learned a lot from being able to have real conversations. The team at The Bushcamp Company learned a lot, as we pushed them to do things they hadn't thought about or executed before. Our guests benefitted by living an experience that they couldn't have arranged themselves or even with a great travel agent. And we benefitted from all of the above. Were there any lost-in-translation moments? The most important thing to realize is that what people want or need isn't necessarily what you think they want or need. What else could the school benefit from? What happens next? The Mfuwe Day Secondary School has changed dramatically in the last two years. Visitors may think it's still very different from the schools in their neighborhoods at home, but it's now providing meals to students, has proper classrooms, dorms, and bathrooms. It could use more. And it could use space and housing for teachers, a proper library, a computer lab, a sports field. But it's one of three upper schools in the town, and those other two need help as well. It's important to build up the whole community, not just one school. Charity Begins at Home understands the community's needs (water, sanitation, education) and prioritizes them; it is now supported by several other safari companies in the park. Now that the upper schools are on their way to being better able to support students and their families, Charity Begins at Home is focusing on what's next — helping the most talented and promising students continue their studies in college. We helped launch the program by providing full scholarships for two students to attend universities in Lusaka, the capital, for the duration of their studies. It's a very powerful thing to be able to help change the lives of a few kids and their community. Everyone in the group felt the local connection and supported the program. Evan and Josh on safari. Has this experience changed the way you think about charitable giving and helping others? We lead a very blessed and privileged life, and it's important to take a step back and ask ourselves what we can do to help others (in whatever small or large way that we can). Discovery and sharing is such an important part of our personal and professional lives that it makes sense to include it in our work whenever possible. Going back and seeing the progress, however incremental, is really gratifying. Making small yet visible steps in a single community isn't changing the world in the way that a big foundation may be able to, but it's a tangible way to share our insight, access, and resources. How can the nice people reading this article help? Figure out what you're interested in and find a place where you can help make a difference with your time, resources, or money. If you want to help make a difference in this town, Charity Begins at Home is a great way to start. Cool Hunting made a reel of highlights from the trip. It's easy to sponsor a student or donate to the . Guests who book at stay with The Bushcamp Company will have part of their trip costs automatically donated. School supplies, clothing, and gifts are also welcome. Charity Begins at Home is a Zambian Registered Charity that is solely for The Bushcamp Company education and community projects. One hundred percent of donations go toward education and community projects. .